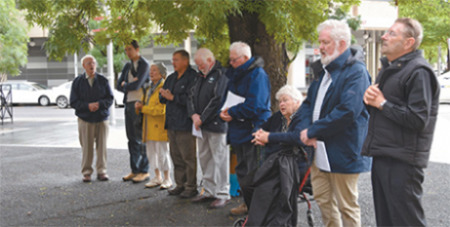 Three pro-life supporters fined after holding prayer vigils in Canberra's abortion clinic exclusion zone will argue the law breaches the Constitution when they fight the charges next month, The Canberra Times reports. Kerry Mellor, 76, John Popplewell, 76, and Ken Clancy, 78, have pleaded not guilty to charges of being in a protected area and engaged in prohibited behaviour under the territory's health laws. The three are members of a Catholic prayer group that has gathered for years and held vigils at the site of the ACT Health building on Moore Street, Civic. In March last year, the ACT parliament passed an amendment to health laws that banned protesting in a protected zone, and imposed hefty fines for a breach. The group continued to gather at the site, and police later fined the three men $750 each. Prosecutors became involved when the men refused to pay and said they would challenge the fines in court. At a brief mention yesterday the court heard the men would argue the exclusion zone law breaches the Constitution. Prosecutor James Walker told the court the men would seek to challenge the law's constitutionality on the basis it breached the implied freedom of political communication and that it imposed on the free exercise of religion. He said the state, territory and federal attorneys-general had received notices about the constitutional arguments, though each had declined at this point to intervene in the case. He said the men would also raise questions about human rights, and mount a challenge to the lawfulness of the Health Minister's decision to declare a protected area around the clinic. The prosecutor said some members of the prayer group had refused to give police statements but would be called to give evidence. The men were not present at the mention yesterday but were legally represented. The court heard the men will be represented at the three day hearing in the ACT Magistrates Court by local silk John Purnell SC. The case goes to hearing on November 6.